Beautiful corduroy jumper dress set with the following features: BROWN & ORANGE GLITTER TUTU DRESS/LEGGING SET features LEOPARD PRINT & GLITTERED TUTU DRESS with BROWN KNIT LONG-SLEEVE BODICE and 'Baby Turkey Chick' APPLIQUE., Pul-on BROWN KNIT LEGGING-PANTS features ORANGE BOW TRIM and comfortable elastic waist band.. Machine wash. Imported (Sri Lanka). Bodice of cotton/polyester/spandex - Skirt of 100% cotton - Tulle of polyester - Lining of polyester - Crinoline of nylon - Exclusive of trim/decoration. Matching/Coordinating sister styles available in sizes 3M-6X, search for style(s): RRE-63812. 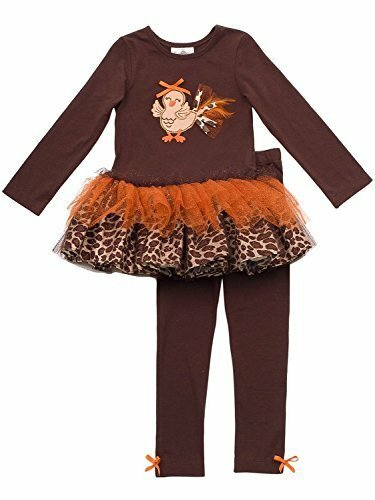 More baby & girl party dresses available, search for: "rre-girl-party-dress "
BROWN & ORANGE GLITTER TUTU DRESS/LEGGING SET features LEOPARD PRINT & GLITTERED TUTU DRESS with BROWN KNIT LONG-SLEEVE BODICE and 'Baby Turkey Chick' APPLIQUE. Pul-on BROWN KNIT LEGGING-PANTS features ORANGE BOW TRIM and comfortable elastic waist band. Matching/Coordinating sister styles available in sizes 3M-6X, search for style(s): RRE-63812.